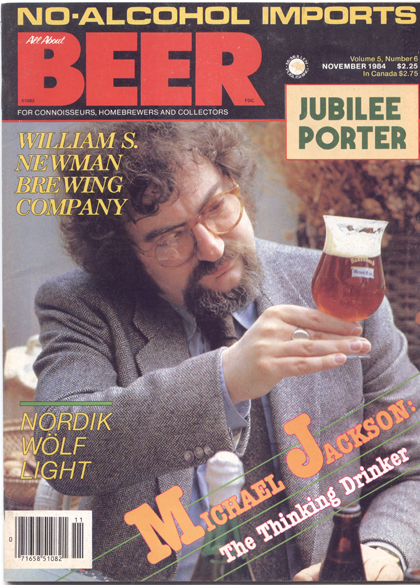 Michael Jackson’s first column in All About Beer Magazine was titled “The Thinking Drinker” and appeared in November of 1984. It had the first-person perspective and the self-deprecating, elliptical style that allowed him to advocate quite pointedly for the best in beer, while remaining unfailingly polite. This introductory feature would become, two issues later, the column “Jackson’s Journal,” which ran in this magazine for 23 years until his death in 2007, his longest relationship with any publication. His final column, “Did I Cheat Mort Subite?” was a thoughtful essay on illness and mortality. It was his last piece of writing. Through those 23 years, and nearly 140 columns, readers learned in asides that he loved jazz, that his family were Jews from Lithuania, and that he had left school at 16 to become a journalist. Mostly, they learned about beer in its largest social context—where it was made, the history behind styles, the dedicated people who brewed it and the communities where it was happily consumed. Jackson’s columns often made me laugh. Once every four or five issues, one would choke me up, because his portraits of people, pubs and neighborhoods were so spot-on. For those without a stack of All About Beer back issues to refer to, here are 10 gems from the electronic archives, all pure Jackson.